9. Rolodex(R) VIP(R) File, 3"
11. 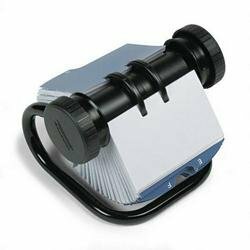 Rolodex(R) VIP(R) File, 2 1/4"
Strong tubular metal frame. Cards rotate and hold steady for viewing. Includes cards and insertable tab A-Z index guides. 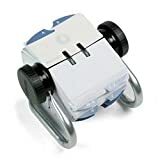 I used 3 of these in my office to track all the numbers I needed.They are sturdy, don't tip over, and quickly flip to the number you want.Now that I'm retired, I have one at home. 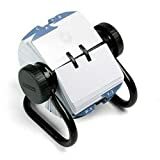 It sure beats an address book with all the crossed out numbers.I can staple a business card onto one of the rolodex cards or write in the address and number.Works great. 3. Rolodex(R) Autodex(R) Telephone & Address List Finder, 7" x 4 1/8"
Strong tubular metal frame. Cards rotate and hold steady for viewing. 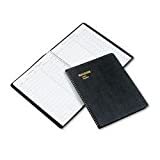 Includes 500 cards and 24 insertable tab A-Z index guides. 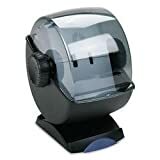 "Address and Telephone Book: With Area Codes, Birthdays, Anniversaries and Personal Information"
360° swivel for full access. 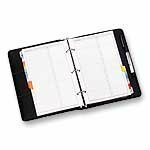 Includes 500 snap-in/snap-out cards and 24 insertable tab A-Z index guides. High-impact polystyrene case. Black base. 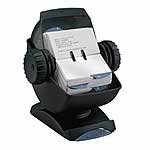 Molded of strong, high-impact black plastic for long-lasting performance. 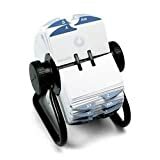 Comes complete with 500 cards and 24 coated index tabs. Record Name, Company, Arrival and Departure Times. Space for 900 entries. White ledger paper. Simulated leather cover. 60 pages, 15 lines per page. Transparent sleeves hold business cards or 2-1/4 x 4 cards (not included). Includes 24 A-Z guides. Black metal.